Andy H: Well, that was quick! Only a couple of weeks ago I was looking forward to Immortal Hulk #2 and now #3 is already about to land. As much as I'm enjoying this title I could do with Marvel getting back to a monthly release schedule, just to make my life a little easier. The first two issues have been corkers and the added bonus for this issue looks like the introduction of reporter Jackie McGee, an obvious nod to the old Hulk TV series, but one that puts a welcome smile on my face as this series is pretty grim reading mostly. That's okay though as Peter Parker: The Spectacular Spider-Man #307 is also out, and that's the perfect antidote to the grim goings on in Hulk. It's been a year since writer Chip Zdarsky started his run on PP:SSM and reinvigorated my interest in the old web-head, and what a fun year it's been. On the subject of fun, could Archie Meets Batman '66 #1 be anything other than a barrel of swinging sixties fun and games? Just how far is Gotham City from Riverdale anyway? The Batman '66 crossovers have been great and I would expect more of the same here. Finally, the end is here, well the start of the end, as League Of Extraordinary Gentlemen: Tempest charts the final chapter of Alan Moore and Kev O'Neill's epic series. Hard to believe it all started 20 years ago and now we face the final curtain. I really enjoyed the first two series but kind of lost my way with the latter ones. I hope this series will reel me back in as I'd love this to finish the way it started. What makes this even more poignant is both Moore and O'Neill say this is their last comics work: a sad day but this should be a fitting send off. Jo S: Image effects a near-complete takeover of my list this week, with a number of recent additions to the favourites pile all from the creator-owned stable. The Weatherman pushed all the right buttons in issue #1, appealing to the SF and mystery fan in me as well as delivering pacey comedic storytelling, so the second issue of that is a must, along with The Magic Order, which oozed quality last time, and got my interest up in spite of a fairly formulaic structure. Skyward has been thought-provoking and sweet-natured, and Flavor has been a delicious taste of a culture dominated by the economics of food, so the appearance of both of these get my taste buds tingling. Top place on the pile has to go to Gideon Falls, though: consistently gripping storytelling from Jeff Lemire complemented by astonishingly inventive, emotive and technical design and art from Andrea Sorrentino put this in a near-unassailable top spot for the year for me. 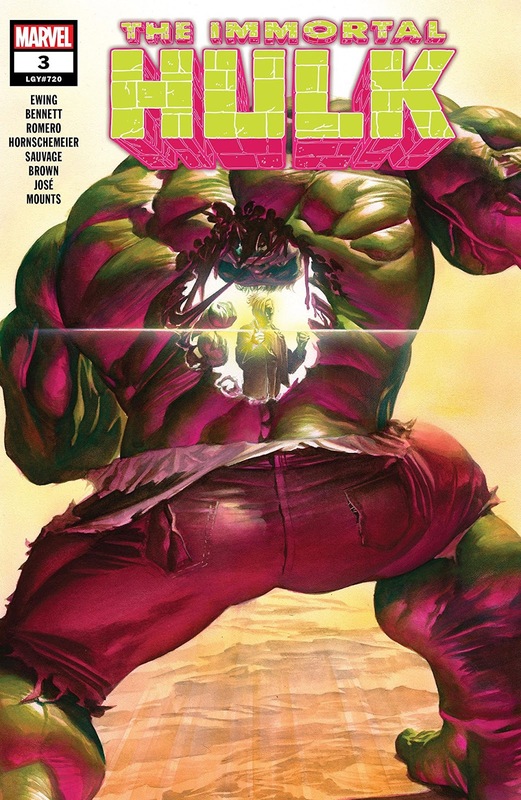 Slimmer pickings come from the Big Two - Immortal Hulk #3 will be my only Marvel take this week, but well worth it so far, with the Big Green reappearing post Banner-mortem to wreak vengeance on the deserving, and Batman #51 just making the cut. I'm going to try jumping onto this series here, following having my heart broken a little by issue #50 - let's see if Tom King can lock in my interest in this as he has with Mister Miracle.